We’ve reviewed a lot of iPhone cases over the years. Some are amazing, but most have at least one flaw. This Silk Innovation Pureview transparent, slim case for the iPhone 7/Plus has no flaws and is a great way to show off the phone’s colors yet provide very good protection. Plus, the value is amazing. It looks tenuous. It isn’t. My theme this year is transparent cases because the iPhone 7/Plus comes in a wide range of beautiful colors. Why cover the iPhone 7 up? That is, unless once needs the kind of protection used in military combat. This case has one very important advantage over a very similar case, the Just Mobile TENC, previously reviewed. While the Just Mobile case is solid polycarbonate, the Pureview is a hybrid of polycarbonate and TPU. It makes a huge difference in the feel and the protection. I’ll get into that below. 4 microfeet to keep the polycarbonate away from surfaces. Polycarbonate back fused with TPU edges for impact absorption and better grip. Easy to insert and remove the iPhone 7. Terrific, soft push through of covered Sleep/Wake and volume buttons. The TPU edges are just as transparent as the polycarbonate back. 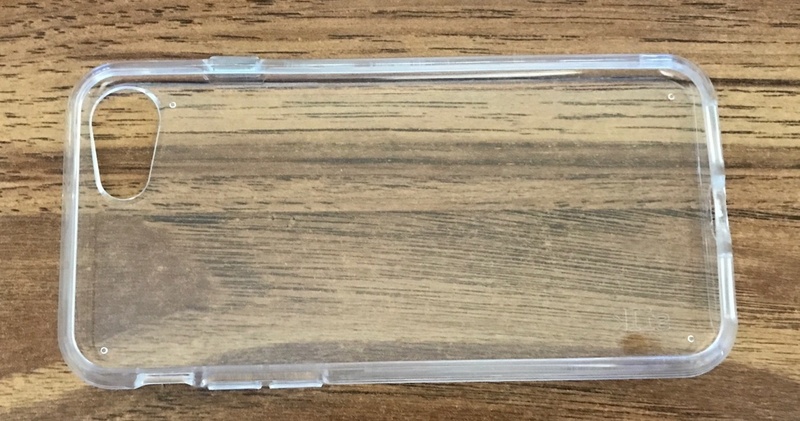 The TPU edges of the case are formed over with the polycarbonate in a heat process, fused essentially. Then the seam is polished. It’s impossible to see a line where the two meet, so it magically feels like one piece of material. This is a very pleasing design. Next, the TPU edge makes all the difference when it comes to the feel of the case. One gets the sensation that the iPhone is well protected, and it is. TPU has better impact absorption than polycarbonate. As a byproduct, the grip is better. These two factors combine to make the phone feel more secure than with a solid piece of polycarbonate. Lastly, the soft edges make the iPhone easy to insert and remove. I previously complained that the Just Mobile TENC was extremely difficult to remove because the polycarbonate edges are so stiff. The soft TPU edges make for great grip and easy button push. 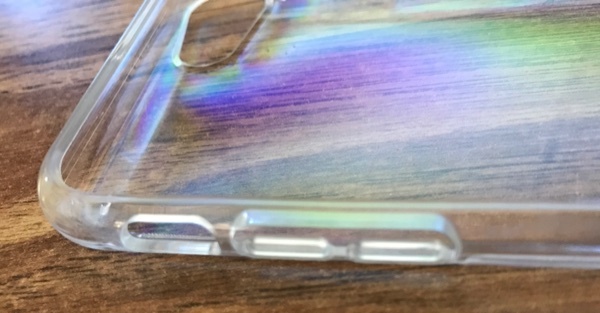 Seam to polycarbonate is invisible. These features combined with the US$12 price creates a pleasing, transparent case that weighs 24 grams and has astronomical performance to price ratio. In other words, high value. Secondly, testing revealed that there is not much need for a blackened anti-glare section around the camera aperture because 1) The case is so thin and 2) the case’s aperture is generously spaced away from the lens itself. I didn’t test this, but the optical explanation has logic. The microfeet not only keep the polycarbonate away from moist surfaces, but also help prevent scratches. The warranty is (limited) lifetime, not just one year. There is a 30-day, money-back 100% guarantee of satisfaction at purchase. 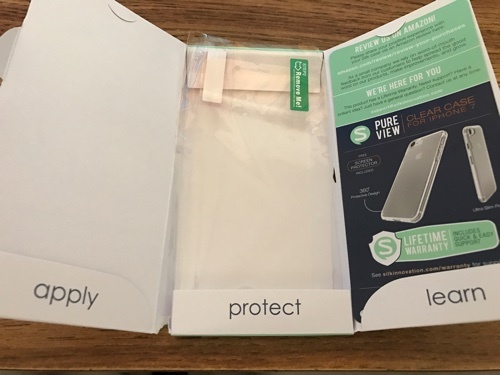 The paper package consists of three panels and includes a two-sided insert that provides warranty information, contact information for support and instructions for the application of the screen protector. It’s not fancy, but it’s thorough. 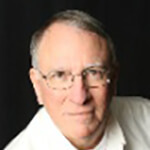 Packaging is recyclable paper, modest but thorough. On a side note, one thing that can destroy the aesthetics of a great case is an obnoxiously large engraved or raised letter logo. This case has the word “silk” on the back edge in small type. That’s all. Low key but easy to identify. Everything about this case has been well thought out. The grip, the protection and the transparency are very good. 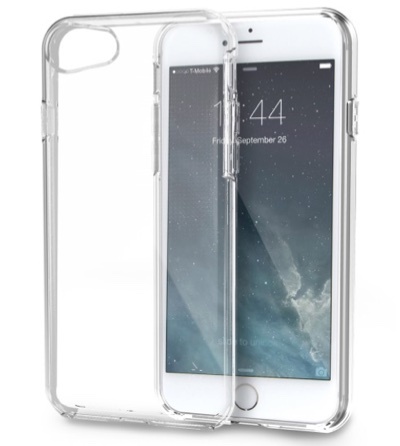 That soft TPU edge and the screen protector turn a minimalist, transparent case into beautiful protection. The requisite features are there, and the price is irresistible. (The price is the same for both iPhone sizes.) I give it my highest recommendation, and it’s now my case of choice. Outstanding Product. Get It Now! Soft, transparent TPU edges, seamlessly fused with polycarbonate back make for impact absorption and great grip. Easy to insert /remove iPhone. Screen protector included. ALmost invisible microfeet. Great price. Lifetime warranty. ziploc: If anything, it’s fingerprints that annoy me on transparent cases. But when I clean the display, I clean the back, and I’m all good. ziploc – I’ve had the same issue with clear cases. Haven’t found a good solution so I’ve just stayed with all black so I can’t see the dirt. What I have found with every transparent case I’ve had is that over time all kinds of dust and other pocket crap gets in there and it looks worse than any non-transparent case. Any feedback on this or other cases ability to avoid this issue? I purchased one of their wallet cases for my iPhone 6s+. Awesome quality and a great price. Not surprised with your high rating. I gave mine ***** on Amazon.